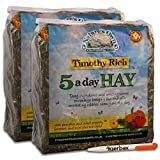 Western Timothy – Looking for a good, basic grass hay with high quality nutrition, and a fresh fragrance that’s irresistible to small herbivores? Oxbow Western Timothy Hay is the ideal long-strand fiber source for keeping small animal digestive tracts functioning properly. Our most popular grass hay with high fiber, low protein and low calcium content’is widely recommended by veterinarians.Alfalfa – is very nutritious, full of fiber, energy, protein, calcium and other nutrients. It is the wonder food of the hay world.Botanical – This enticing blend unites Western Timothy Hay with a rich array of three of the following fragrant herbs: chamomile, lemon verbena, hibiscus, lavender, rose hips, comfrey, borage or red clover blossoms.Organic Meadow – is 100% certified organic grass hay. Grown all-naturally without the use of any chemicals, Organic Meadow Hay guarantees that you are feeding high-fiber hay that is beneficial for your pet and the environment. Organic Meadow Hay is composed of a variety of naturally occurring grass hays providing an enticing combination of textures, fragrances and flavors.Oat Hay – Your animals will love the immature oat grain that is attached in the head and will benefit greatly from the fiber in the leaf and stem. Oat Hay is a good source of fiber and gives variety to your animal’s diet. It also makes good bedding alternative to wheat straw.Orchard Grass – Animals love the sweet smell and taste of leafy Oxbow Orchard Grass Hay, and that makes it a good addition to an herbivore’s healthy meal plan. Like other long-strand grass hays, the soft-textured Orchard Grass Hay is high in fiber, low in protein and supports the health of small herbivores by stimulating digestion, preventing obesity and making mealtime more appealing. An extra special, unique Timothy rich hay with the luxury of added pumpkin, sweet peppers, beetroot, mint and marigold for an extra special treat for your furry friends. Tasty ingredients and enticing scents encourage foraging fun and offer interesting nibbles throughout the day. This hay is made from a very special mix of grasses, rich in Timothy, that is grown especially to make this bale. Most of the drying process is done outdoors in the field but is finished off using a special mechanical drying system. This ensures the colour and sweet hay smell is retained and the final moisture content is controlled. All this ensures top quality hay that provides a real treat every time. 5-a-day Hay is high in fibre, but also low in protein and calcium, which is ideal to keep your little friend super healthy. The Tigerbox anti-bacterial pen is an excellent addition to any pet bundle. A unique active agent is moulded into the pen, killing 99.9% of all harmful bacteria & viruses. An extra special, unique Timothy rich hay with the luxury of added pumpkin, sweet peppers, beetroot, mint and marigold for an extra special treat for your furry friends. Tasty ingredients and enticing scents encourage foraging fun and offer interesting nibbles throughout the day. This hay is made from a very special mix of grasses, rich in Timothy, that is grown especially to make this bale. Most of the drying process is done outdoors in the field but is finished off using a special mechanical drying system. This ensures the colour and sweet hay smell is retained and the final moisture content is controlled. All this ensures top quality hay that provides a real treat every time. 5-a-day Hay is high in fibre, but also low in protein and calcium, which is ideal to keep your little friend super healthy. The Tigerbox anti-bacterial pen is an excellent addition to any pet bundle. A unique active agent is moulded into the pen, killing 99.9% of all harmful bacteria & viruses.